On December 12th in 1933, Boston Bruins blueliner Eddie Shore drilled Toronto Maple Leafs scoring sensation Ace Bailey in response to physical play by penalty killers King Clancy and Red Horner. Horner recalls, "He [Shore] hit Bailey and flipped him in the air, just like a rag doll. Bailey landed on his head just a few feet from where I was standing. Bailey hit the ice and he went into some kind of convulsion. I thought to myself, 'That's the end of Ace!'" The blow fractured Bailey's skull in two places ending his playing career and very nearly his life. Horner promptly punched out Shore, rendering him unconscious with a three inch gash in his head resulting in seven stitches. Both players were carried off the ice by teammates. In the aftermath, Leafs GM Conn Smythe was jailed for striking a fan accusing Ace of faking his injury and Bailey's father traveled to Boston to exact revenge. Smythe was released the next day after agreeing to cover the fan's dental fees and Bailey Sr. was sent home without incident. Offered a slim chance to live after two risky operations, a priest was summoned to read last rights. Bailey, however, fought through the night and by Christmas was expected to survive. Shore was suspended indefinitely, reinstated on January 28, 1934 after 16 games when it was clear Bailey would live. Horner sat until January 1, 1934. Adding to the Bruins $8,000 contribution ($342,000 present day), the NHL hosted its first All-Star game raising $20,909 for Bailey ($900,000 present day). 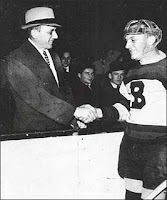 Bailey embraced Shore prior to the game resulting in the loudest ovation ever heard at Maple Leaf Gardens. Shore apologized to Ace maintaining that the hit was purely accidental. Bailey never held a grudge, claiming "It's all part of the game."